General Hospital Spoilers: Sonny And Carly Struggle – Will Margaux Split Up CarSon? 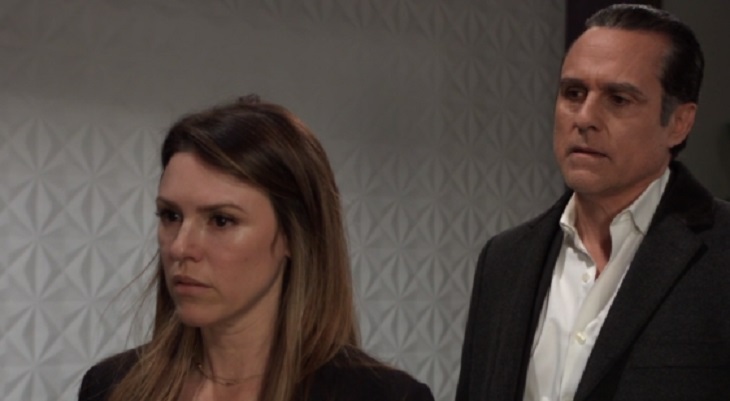 General Hospital (GH) spoilers tease that it may look like Sonny Corinthos (Maurice Benard) is considering cheating on Carly Corinthos (Laura Wright), that is not that case. While Sonny is having a close friendship with Margaux (Elizabeth Hendrickson), he isn’t considering cheating on his beautiful wife. The partially reformed mobster knows that if he cheats on his wife, she will probably leave him for good. The actress who plays Carly, Laura Wright, believes that CarSon is on solid ground. She said they have weathered so many storms together. They have been through many things and now they are on solid ground. They each are going through their own personal things, but together, as a couple, they are great together. The one thing that Sonny loves about Carly is she will call him out on his own stuff. He cannot fool her, and she doesn’t hold her tongue with him. For Sonny, that is a great thing as the people around him are often telling him yes to everything. General Hospital Spoilers – How Does Margaux Fit into CarSon’s Marriage? Sonny and Margaux have an emotional connection that is special to both. It is unlikely it would cross over and become a physical thing, but anything is possible on the ABC soap opera. Carly told Jason Morgan (Steve Burton) that if Sonny cheats on her again, she will leave him. And, if she leaves him again, it will be for good. Maurice said that he would love to see a love triangle between Sonny, Carly and Margaux. However, he still isn’t sure where the writers are going with his storyline. Do you think Margaux and Sonny will end up together? Don’t forget to come back later for more General Hospital (GH) spoilers, news, and casting updates!